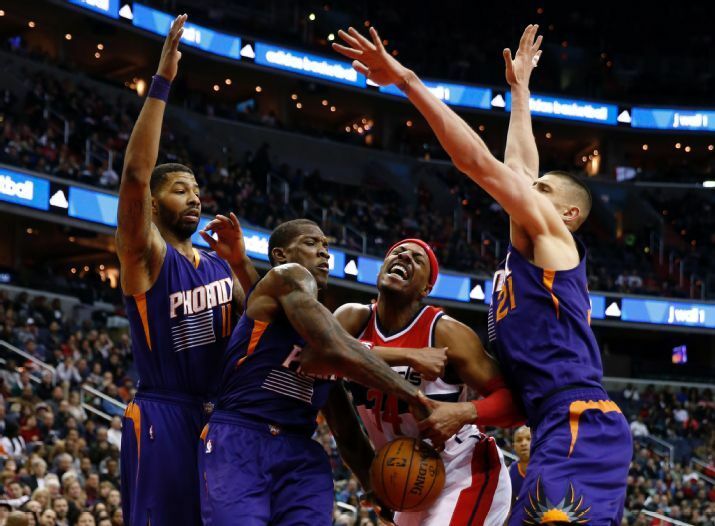 The Suns beat the Wizards 104-92 behind hot shooting from Markieff Morris who went 7-14 from the field with 17 points. It wasn’t so much the volume as 17 points isn’t going to amaze anyone but it was the timeliness of his buckets. Whenever the Wizards would make a push and cut the lead to 6-8, Marfieff had an answer. The Wizards biggest Achilles heel, speedy guards (in my opinion) reared its ugly head tonight. The Wizards simply had no match for the Eric Beldsoe, Goran Dragic, and Isaiah Thomas combination. The three guards combined for 43 points. The three guards looked to push the ball at every opportunity possible. Additionally, John Wall had trouble staying in front of both Eric Bledsoe and Isaiah Thomas in the pick and roll game. The Wizards started the game nicely and it looked like they had left their lackluster performance in Miami in the rearview mirror. The Wizards looked to push early and often and John Wall had four of his eight assists in the first period. The Suns had a good amount of their scoring coming from Markieff Morris and Gerald Green in the first half. Marfieff won the MIP award last year and he showed tonight that he deserved it. In his days at Kansas, he was a back to the basket, post-up player. He’s transitioned nicely into a small forward or power forward when the Suns play small. With the game tied at halftime, Paul Pierce came out and hit the first jumper of the 3rd quarter to put the Wizards up 52-50. There was a feeling that the Wizards had recollected themselves and were ready to come out inspired. The Suns had different plans. The Suns used a 9-4 run to start the quarter and had an early five point lead at the 8:09 mark. The Wizards had some very sloppy turnovers in the 3rd quarter which allowed the Suns the stretch the lead to 13 at one point. The closest the Wizards were able to cut the lead to was 6. In the end, too much speed on the perimeter and timely shots from the Suns was the difference. Wizards have a huge test on Tuesday as the Bulls come to town looking to seek revenge from last year’s early playoff exit.